Judging from all the data I’ve given to Netflix, I’d blame them for not suggesting this show to me - Fargo. I remember reading the phrase “black comedy” on Wikipedia, but I didn’t find myself laughing any moments of the show. It’s dark, patient, and tense. And of course, I love it! 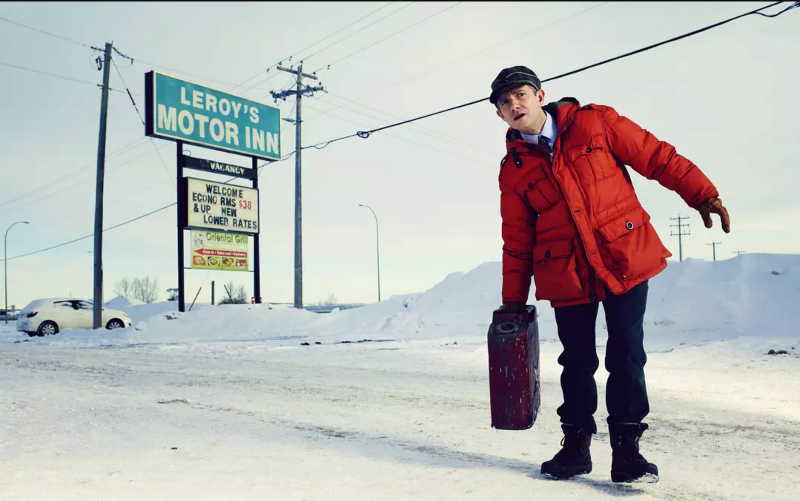 Lester Nygaard (Martin Freeman)… the protagonist (or antagonist, or turn-to-be antagonist). You started off by rooting this mistreated guy. His wife always compares him to his brother, hinted she might have married to the wrong one. The sudden encounter with his high school nightmare - the bully, and found out the bully actually had a one-time affair with his wife, and then indirectly broke his nose. The low self-esteem that needed those “inspiring and positive” quotes hung on the wall to constantly remind him: “what if you’re right, and they’re wrong?” You see the struggling and desperation of Lester. Then he bumped into a mysterious stranger of the town, after sharing his misery story, the guy offered him a yes-and-no question: “Do you want that bully to die?” From that moment, Lester’s life changed completely. I enjoyed this show very much. The gradually built-up tension and fear took my breath away. There were moments I sensed violence but nothing happened, and the next scene, boom, and blood. You’ve got to see what could happen to a guy who is absolutely smart but lack of self-esteem, and once he overcomes that, in a dramatic way, how much of his ego could grow to explode. And the mystery hitman by Billy Bob Thornton was super charming. In a way I respect his “style” - not just about killing, not even about elegance, I don’t know what word would best describe it yet - manipulative, efficient, aggressive, deceivable, and patient. After watching all of the movies and tv shows, this killer would definitely earn a position in my memory hall that won’t be easily flushed away in a long time. So is the show. I use Page Links To plugin to redirect the "about" page to http://about.me/kinopyo url. This plugin allows you to make a WordPress page or post link to a URL of your choosing, instead of its WordPress page or post URL. It also will redirect people who go to the old (or "normal") URL to the new one you've chosen (301 Moved Permanently redirects are standard, but you can choose a 302 Moved Temporarily redirect if you wish).